Once I saw Trevor Phillips “Has Politically Correctness gone mad?”, I watched more. There were flags, and then …. In the intro to political correctness he spoke of losing out on 3 extremists, Brexit May and Corbyn; that was a flag he saw Corbyn as extremist. He spoke often of being the liberal that people like Farage are against so “being liberal” was a flag. When I watched “Things about race etc”, I was pleased to see him raising issues that Liberals don’t usually discuss. Things were going well. Yes some Jews do have too much power because some Jews are very rich and powerful. But at the same time some Jews are not rich and powerful, and attack their own “rich and powerful”. He did say they were richer on average but that still does not mean all Jews are the same. Trevor criticised people who said “All blacks are the same”, further discussed diversity training as suggesting erroneously “All whites are the same”, yet he is saying all Jews are the same – rich and powerful. I learnt from black people how not to be racist, because black people should be treated differently and I should not accept media stereotypes. 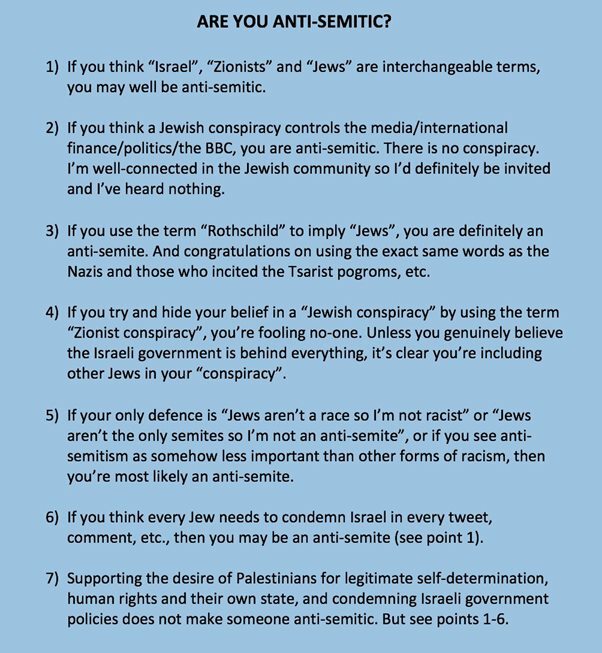 I learnt from Jews through the 6 tenets how not to be anti-semitic, Trevor needs to examine himself in terms of these 6 tenets. It is not usual for me to describe black people as racist. I subscribe to the maxim that Power + Prejudice = Racism, but in the world of the liberal elite Trevor Phillips has power so he has the potential for misuse of power. In describing the Jews in this way he is being racist, because he has the power to influence. This was a bad flag. When you talk about “all” in terms of race then you take a risk because all black people are not the same nor are whites nor are Jews. I understand this position on Jews, it is common amongst liberals and the left because some Jews are powerful – are 1%. I have to recognise ego in this. I was also disappointed that he did not confront some black issues. When he addressed the violence of black youth he was extremely careful not to offend black people. This negates the whole point of his programme – to expose the racism that is propagated by liberals avoiding causing offence. At first he used police figures to say that Colombians controlled violent street crime in South London. In the 80s word said it was the Jews in Camberwell who were controlling the street crime because they were supposed to have bought the stolen goods. Then when he discussed the actual figures of violent street crime, Trevor used the sentencing figures rather than stating that black youth were carrying out violent street crime. This was liberal avoidance. There are many institutional issues involved with the criminalising of black youth but how much is there a propensity for black British to be involved in street crime? I cannot answer this as I don’t live there now. In the 80s all the arguments concerning the criminalising of black youth by institutional racism, police racism and the general racism in society were true, but some of the black youth themselves still choose to participate in street violence. In my view Trevor is completely correct in confronting the liberal avoidance embodied in political correctness but in doing this his approach has to be almost perfect – above criticism; again in my view on these two issues his approach has to be questioned. But the above is nothing compared to what he came out with concerning Muslims – “What British Muslims really think”, I was horrified. After seeing so much good stuff about exposing PC bullies it was a surprise. But in the context of the above flags it is not a surprise, a black person can show prejudice. In my view he also showed typical liberal weaknesses. He criticised violence yet ignored the violence perpetrated on Muslim countries. He focussed on criticisms of homosexuality – a liberal issue, he concentrated on Muslim minority views, and he also criticised the Muslims because of a small percentage of violent views. He began by quoting Cameron talking about British values, this is well-established code for racists who insist that others adopt a British way of life – whatever that is. It is not an appeal for what non-whites should do but trying to appease white people with having non-whites in the country. Gina Yashere in a comedy routine talks of the anger of her Nigerian mother at immigrants coming taking her jobs. Rather than being an advert for diversity Trevor appears to be adopting Gina’s comic caricature. To me there is a good deal of inconsistency in his position. I mentioned already that Trevor was “around” when I was learning about racism in the mid-to-late 70s. I am now going to make a comparison between black activists in the 70s and Trevor’s criticism of Muslims. This is a subjective comparison. As this is not an academic blog I offer no proof, and I am making assumptions that the position of black activists I am putting forward is the same position Trevor held at the time – I have no right to do this but I don’t believe I am wrong. My point is this. I believe that many of the criticisms that Trevor has of Muslims parallel criticism of 70s and 80s attitudes towards black people. I assess that he and many people consider that black people have sufficiently integrated now, so by drawing the comparison I am saying “give it time”. I first want to begin with the issue of terrorism. Evidently there are some British Muslims involved in what the world calls terrorism – as defined by the West in their War on Terror. In the 70s and 80s black people were supporting violence. This would be the violence in which black people were overthrowing the British (or European) colonialists, this would also be the violence of the slaves in terms of their suffrage. There would also be many black people who would be supporting struggles against the neocolonial puppets who were in charge throughout Africa, freedom movements or freedom struggles would be common descriptions. 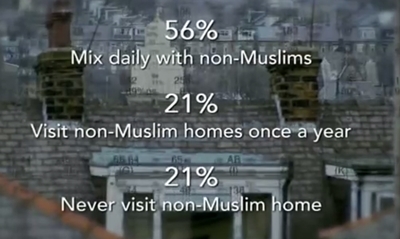 In Trevor’s programme on “What British Muslims really think?”, he based his criticisms on a Channel 4 survey. The survey asked whether Muslims supported violence, and the answer was 4% did. In the 70s and 80s if black people had been asked if they supported violence, I would suspect far more than 4% supported violence; and many more would have said they understand the use of violence – such as the criminalising of black youth. In the 70s and 80s the recent history of black people had been affected by the violence of colonialism, and their response at the time would have been to accept that violence could be a legitimate response. The degree of violence that Muslim people have been subjected to since 9/11 is comparable to the violence that black people suffered – I use the word comparable loosely because measuring the violence that black people suffered through slavery as well as colonialism as compared with wars in Iraq, Afghanistan, Libya, Syria, Somalia and Yemen are horrendous events to try to “compare”. But the violent attacks on these predominantly Muslim parts of the world are “recent”, and therefore feelings amongst Muslims would also be “recent” – comparable with the acceptance of violence by British black communities in the 70s and 80s. But Trevor did not attack support for violence, the survey discussed the acceptance of violence but Trevor jumped to interpreting the survey’s acceptance of violence as accepting terrorism. This is a big jump. British governments might well have described the freedom struggles of the African peoples as terrorist, history now sees such struggles as legitimate, and because of white control of media little mention is given of the true nature of colonialism and neocolonialism. If Muslims feel that violence is a possible response to dictatorship in the Middle East, or if Muslims feel violence is a possible response to wars in Afghanistan, Iraq, and Libya, or if Muslims believe that violence is a possible response to the drone strikes on Yemen and Somalia, this would be totally consistent with history’s support of freedom struggles in Africa – totally consistent with any black support of violence in their freedom struggles. But support of freedom struggles is not support of terrorist acts. If the survey had asked “do you support acts of terrorism such as 7/7 or the other bombs within the countries of the NATO hegemony?”, I very much doubt whether the figure would have been as high as 4%. When NATO troops invade Muslim countries for whatever reason, isn’t violence a legitimate response to invasion? To me Trevor appears to have forgotten his history. Over the years I suggest that British black attitude to violence has become aligned with the “general” population, and there is no reason to think that British Muslims would not also align themselves as they become distanced from their recent history of experiencing violence. On homosexuality there is an interesting article in the Guardian on its practise in Muslim countries. When I worked in the Middle East (Muslim Arab countries) I had the feeling – no more than that – that homosexuality was tolerated in those Muslim countries. However there are other Muslim countries where the attitude to homosexuality is so different. I surmise that the attitude of the Taliban towards homosexuality would be very different to that of more tolerant Muslims in the Middle East. Traditionally black communities have not been tolerant of homosexuality, and some African countries to this day show intolerance – Uganda and others. However over the years this intolerance by black people in Britain has liberalised, and has aligned more to that of white people. It would not be unreasonable to expect British Muslims also to align themselves with the more liberal attitudes that are accepted “generally” in the wider population. On segregation Trevor is again fanning flames. When I grew up white middle-class lived separately from white working-class, and held different values. In the middle-class community of my youth it was not written but understood that these classes were separate, and bringing home a working-class girl was almost as bad as a black woman. Separation is not a problem, and is normal for British life. How many people have been invited to the home of a lord? This is also inflammatory. If this was going to be used as an indicator of Muslims creating problems through segregation, it would have been an appropriate comparison to ask now how many white people have been in black homes. Back in the 70s and 80s it was just as rare for black and white to meet outside work – sunset segregation. Equally it was rare for Indians and whites to meet outside work. Again my point is that it is not Muslims creating this issue. How many white people invite Muslims into their homes? If such an invite occurs, how many Muslims have not reciprocated? I have only known Arab Muslims, and not in Britain, they were hospitable but I was never invited into their parents’ home because I was a lowly teacher. Back in the 70s and 80s I was in and out of black peoples’ homes but that was because my personal life involved black people but I doubt very much whether there was anything other than sunset segregation for most of the teachers. I also think it significant that white culture accepts drinking, but on drinking Muslim culture is better (not dependent on drugs) as it is expected that people abstain. Much sunset socialising is done in pubs after work, I don’t know whether Muslims would join in – I know how uncomfortable I feel when I watch friends deliberately moronicise themselves when drinking. Separate schools for Muslims is always considered a segregation issue yet back in the 70s and 80s British black people advocated supplementary schools. If black people are now considered integrated such an advocacy hasn’t hurt. In the late 70s and early 80s I taught in Brixton, and also taught part-time at Gresham. This was a black only school, and it was a tradition that came over from the Caribbean where black children were additionally taught in supplementary schools. These supplementary schools were especially important for black students because teacher expectation in mainstream schools, amongst other factors, was lowering their achievement. Bernard Coard’s book “How the West Indian child is made educationally sub-normal in the British school system” was typical of black viewpoints at the time. It was written in the early 70s, and is discussed here in the Guardian 10 years ago, and here. This separate schooling was part of a Caribbean tradition of “Saturday schools” (supplementary schools) to promote their cultural interests, and to avoid the institutional racism that existed in schools. What is wrong with Muslims wanting separate schooling now? In fact it could be considered that the issue is worse for Muslims because of the War on Terror which has been turned into a powerful Islamophobic movement across the world. This probably means that the anti-Muslim racism is far worse in schools; when I taught in the UK in 2003/2004 there was a serious tension regarding Islamic students. It must be worse when teachers are expected to report on potential “student-terrorists”. In general Trevor confronts liberal weaknesses, this is positive. I have observed certain characteristics, this is not all liberals but these characteristics can be seen. Some Liberals I have known have not overcome their own racism, they do not have a deep commitment to equal rights and tolerance. There is a level at which their commitment turns to fear. Typically Liberals welcome black people who subscribe to their same Liberal views, would welcome black people in their parties etc., but they are still afraid of meeting a black man on the street. This is not all Liberals, and it might be a bit dated as a scenario but it illustrates liberalism. There is not a commitment to black culture – whatever that is, there is not a deep tolerance but if black people want to behave the same liberal way (Cameron’s British values) they will be welcomed. This liberal fear is significant because such liberals are afraid to face themselves, they don’t want the depth of their commitment to be questioned. It is similar to the difference between intellect and insight, there is intellectual acceptance when there is agreement but there is not the insight that is committed to accepting difference. In this Trevor is the same because he cannot accept the illiberality of Muslim dogma. What is this iliberality? The usual traditional Muslim bugbears – anti-gay, women walking behind men, etc. Let me be clear I dislike those attitudes, as a compassionate man I cannot accept such. But I completely accept the right for communities within any country to have such values, and so long as they comply with the laws of the country there is no conflict. There are conflicts that arise with such communities within a liberal country. When traditional Muslim children attend Liberal schools such conflicts are exposed. Liberal education would expose such traditions, but so long as such conflicts are resolved within the community there is no issue. In many ways there is a requirement of such communities to live separately in order to maintain their Muslim identity, no problem with this. As a leading Liberal I would have hoped Trevor would have stood up against Islamophobia but his programme propagated it disgracefully. My Google search showed only the right wing press commenting on his efforts, did he achieve his objective in questioning liberal attitudes? Perhaps not if he was fostering Islamophobia and antisemitism. Confronting liberal prejudice is a noble aim but is no excuse for prejudice – overall disappointment. Back in the 70s/80s many black people would use the word “honky” to speak derogatorily of white people. As a result white people would say black people were racist. But there was a big difference, these people dishing out this insult had no power. White people controlled jobs, housing – basically the money black people could receive, so when white people applied their prejudice it had an effect; being called a honky qualifies under “sticks and stones can break my bones but names can never hurt me”. What I want to get at here is that because Trevor is black does not mean that he is free from prejudice. With regards to Jews and Muslims Trevor has shown prejudice, but worse because he has some power his poor attitude has impact. I welcome Trevor’s opening up of liberal weakness – weakness that means issues are not faced. In my view it is this weakness that has created PC madness, and the resulting alienation of so many white people. But because Trevor has shown his own prejudice, such questioning will have had its impact lessened. Liberal – does not discuss the violence of the British state eg police tactics or NATO involvement. Unity Platform – beware the Liberals have come! !